The New Hollywood era of cinema, primarily in the 1970s, is one of sublime virtue for its many directors that subverted the classical tropes and styles of numerous film genres. Crime movies in particular stood out by becoming grittier in their overall presentation, and also portraying complex characters whose developments sometime exceeded the quality of the plot they’re caught up in. While it’s easy to pick either Francis Ford Coppola or Martin Scorsese as the best auteur of the genre at the time, there is one name that deserves just as if not more recognition for his work, and that is the late great, Sidney Lumet. As much as he deserved his title as a true auteur of his craft, Lumet was at the same time an equal opportunist director who made sure his cast and crew were just as important to the production of his movies. His notoriety as an “actor’s director” is unlike any other, which is why his films combined for 17 total performances that were nominated for Oscars in the lead and supporting categories. Two of those nominations were well earned in one of several crime masterpieces Lumet made in the 70s, one of which was the brilliant heist-gone-wrong flick, Dog Day Afternoon. Al Pacino, who two years earlier in 1974 was nominated for Best Actor in Lumet’s Serpico, plays Sonny Wortzik, a rookie criminal that attempts to rob a Brooklyn Bank with the help of his friends, Sal and Stevie. Everything however starts to go wrong once the trio holds up the bank’s employees, beginning with Stevie fleeing the scene out of fear, and that they have missed the departure time of the daily cash pickup. Left with just a $1,100 score, Sonny and Sal are then trapped inside when the police, media, and a large crowd of locals, surround the building, essentially turning the scene into one giant media circus. 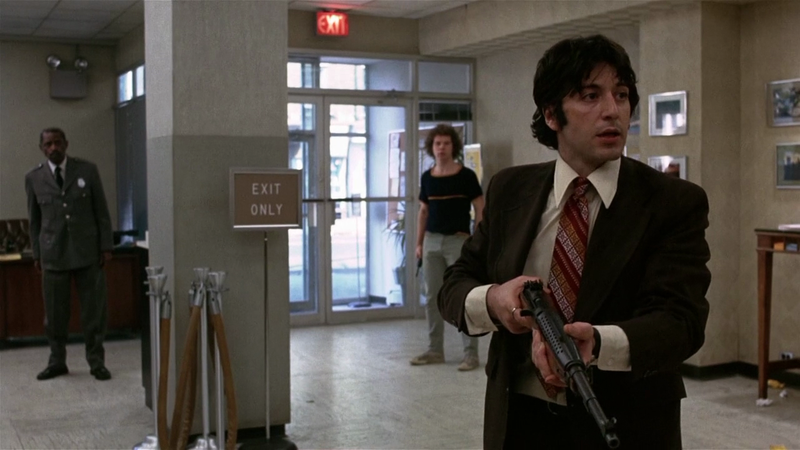 Although billed as a crime drama, Lumet crafts Dog Day Afternoon as much more than just your average heist film gone wrong. Its 1970s setting plays smartly off of real-world issues of the time, including the country’s divide on the LGBT movement, and the distrust of police forces after the famous Attica Prison riot. All of this gives the film an anti-establishment tone where authority isn’t respected, and Sonny’s famous “Attica! Attica!” chant immortalizes him as a likable criminal in the face of the civilians outside. Furthermore aside from the social satire, the film also boasts a great dose of dark comedy in terms of how many things go wrong in the heist. Sonny’s distrust of the police also leads to some great one-liners, as does the meek manner Sal maintains during the entirety of the hold-up. Al Pacino’s versatility as one of cinema’s greatest actors is on full display here as Sonny Wortzik, and he delivers one of his all-time best performances in portraying the sloppy, yet complex criminal. Sonny tries his best to act hard as the man in charge of everyone held hostage in the bank, but the failure of the heist puts his Catholic faith into action by becoming sympathetic to the employees so they don’t get hurt by him, Sal and the police. Pacino is utterly captivating throughout in conveying Sonny’s vulnerability in the spotlight of both the heist and personal issues clashing with one another. Ultimately, Pacino pulls off the rare feat in portraying a criminal that is very likable to the public, but also doesn’t glorify him too much as a hero by reminding that Sonny’s incompetence as a criminal still defines him as a true anti-hero. Aside from Pacino, Lumet also brings out great acting showcases from his diverse supporting cast, most notably John Cazale and Chris Sarandon. Cazale, who in his brief but brilliant career starred in only five films but all of which were nominated for Best Picture, is superbly subdued as Sonny’s criminal parter Sal, who’s compliant with Sonny’s handling of the media madhouse outside, but also proves necessary multiple times in preventing Sonny from making decisions that could put both their lives in more danger. Even with less than thirty minutes of screen time, Sarandon is an emotional powerhouse as Sonny’s wife that has an indirect involvement in the heist. In the hands of another director, the poignant themes and unique tone that Dog Day Afternoon carries wouldn’t have been as well-realized. Thankfully, Lumet’s stark style of social realism and immense compatibility with his actors make this film the classic it is. Fans of heist movies will enjoy it as an experience that portrays the type of people that aren’t made for the robbery game, but even more for how it captures the zeitgeist of 1970s social unrest. Previous ArticleMovie Review - "Wild Tales"